When you should start spring cleaning. There is no set time that spring cleaning should happen. I personally have never gotten a letter in the mail saying spring cleaning should start on this date or that date. Everyone that does it regularly has their own rhythm or reason. So if you don’t have a reason I will share a couple that just make sense. If you live in the south east like we do, I personally like to wait until pollen season is over. The southern yellow pines drop a really heavy yellow pollen that on a bad year can make a busy road look like smog. It is best to wait until a heavy rain has washed away the last remnants of yellow nuisance. Many folks up north wait a bit later than us that enjoy a typically milder climate here. Waiting until you no longer need to use the furnace prevents the dust from being blown all over the house once it has been turned on. It is also a good idea to have any maintenance done on your furnace that it may need before the spring ritual begins. Another good time to start is before the spring in February. The holidays are over and people are beginning a new year. Some are still holding strong to your new year’s resolution, or you are just happy that life has returned to its normal routine. 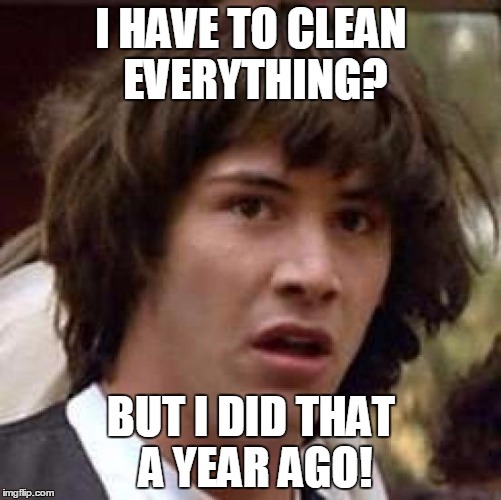 Either way this is a great time to spring clean, and part of that is getting organized. Especially if you are a paper stacker…you know who you are. You may even get your taxes done early or at least locate all of those statements.